Slow Bee package mod for FS17. Contains: carpenter, 2 beehouses, honeymilk-production, shopbuilding, barrel for transport. Carpenter: Deliver boardwood-pallets to the loading zone, or throw wood on the saw inside the house to produce beehives. Honeymilk-Production: Before you can use this production, you have to build it. 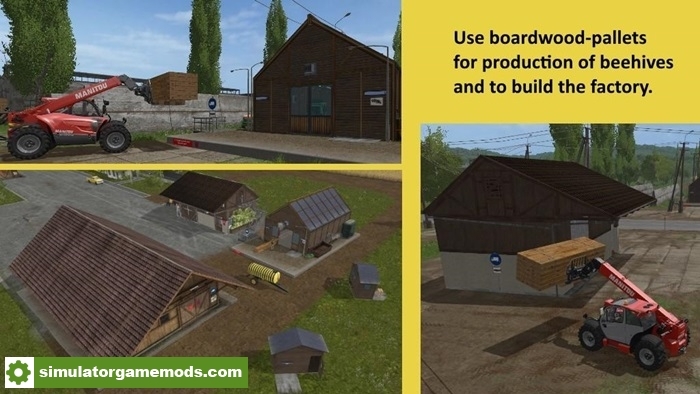 Deliver boardwood-pallets to the sign or bring wood to the center of the floor and with increasing capacity more and more of the building appears. 16000 l are needet (4 woodboard-pallets, or 1 – 2 trees). The building is ready if the plants at the wall appear. After this you can start your production, if you deliver milk and honey to the factory, to get honeymilk. For the transport of milk and honeymilk you can use the added barreltrailer. (You find it in shop-category “animals). Shopbuilding: Here you can sell everything, that ist produced in this pack. Beehives, honey, honeymilk and also milk.